If you have time to venture a bit further afield from Nerja, there are many picturesque villages and small towns to be found in the province of Malaga. The province is studded with charming "pueblos blancos" (white villages) that can be visited by car in a number of delightful day trips. 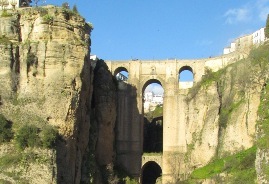 Perhaps the most well-known of these is Ronda, positioned in a much-photographed stunning position on the top of the sheer-sided Tajo gorge. 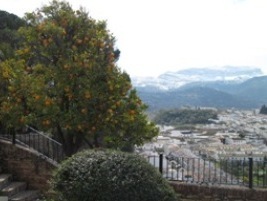 Ronda is remarkably appealing with a beautifully preserved old town and many great bars and restaurants. About a 2 hour car journey from Nerja, Ronda is famous worldwide for its dramatic escarpments and views, and for the deep El Tajo gorge that carries the rio Guadalevín through its centre. Head for the 18th century Puente Nuevo 'new' bridge, which straddles the 100m chasm below, for its unparalleled views out over the Serranía de Ronda mountains. You should also take the path down into the gorge in order to see the bridge and town from below. 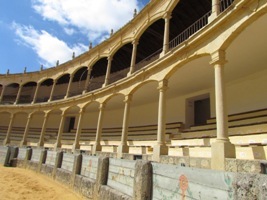 Ronda is also famous as the birthplace of modern bullfighting and its bullring is one of the oldest in Spain. Built entirely of stone and inaugurated in 1785, Ronda's "Plaza de Toros" is younger and smaller than that at Sevilla, but it is considered the birthplace of modern bullfighting, breaking away from the prevailing Jerez 'school' of horseback bullfighting to found a style of bullfighting in which matadores stood their ground against the bull on foot. Once a year it hosts the spectacular Feria Goyesca when a bullfight in honour of the legendary Pedro Romero (1754-1839) is held. Pedro Romero is said to have killed nearly 6,000 bulls here and at other corridas (bullfights). On this day the bullfighters and their assistants all wear costumes reminiscent of those worn by characters appearing in Goya’s paintings, whilst the ladies delight in showing themselves off in the most gorgeous dresses. The rest of the year the bullring is now a museum, the "Museo Taurino", and it contains many of the most important outfits and bullfighting regalia from the last two centuries, as well as an extensive collection of weapons used by the Real Maestranza during Spain’s many wars.